For thousands of years, the sacred wisdom was transferred through the resonance of mantra chants as the most empowered “Shaktipat” awakening energies. Enjoy the music and the blessings of the Sages! The Siddhars are enlightened Sages who journey beyond the realms of the limited mind state. They are in the state of higher consciousness that is beyond sleep, dream and wake. It is this divine state called Turiya that they sing and chant and dance in the higher resonance with sublime bliss. Thousands of years of sacred empowered wisdom was not passed from Guru to disciple through books or even oral teachings. The potent wisdom was imparted through resonance, through the alight grace within the mantras. Through the whack of resonance (also called Saktipat/Sivapat) was the awakening of self-knowledge, innermost stillness and the ecstasy of bliss and joy. 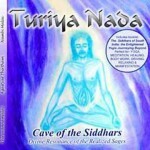 Debut Album of Turiya Nada: Cave of the Siddhars is the sacred transmission of powerful and potent mantras and meditative energies that have been passed down through an ancient lineage of enlightened Sages, the Siddhars of South India. 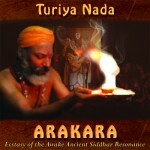 Accompanied by the didgeridoo, harp, singing bowls, djembe, udu, gongs, flute and other instruments, each track of Turiya Nada ‘s “Cave of the Siddhars” will take you on a mystical spiritual journey that will both delight and transform you! Combines powerful Siddhar mantra chants of the enlightened yogis of South India with the didgeridoo, harp and percussion. Chants that have secretive and hidden for thousands of years even in most of India. 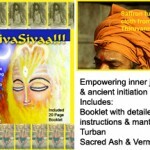 CD includes 12 page booklet including the chants and an insight into the mystical yogi traditions. Enhance the depth, intensity and intent of your yoga & meditation. Transform your inner and outer world by simply listening and enjoying Source energies! This special album, Invoke the Masters is the continued inspired breath of Cave of the Siddhars. Invoke the Masters has been described as a ‘notch’ more powerful / intense than Cave of the Siddhars. ‘Inner Aum’ to invoke the Goddess energy and stimulate the ‘moon breath’ to create harmony with the kundalini awakening- Track One. The sacred experiences of the pilgrimages to the sublime realms of the enlightened yogis that are conveyed through the chants. Potent Siddhar chants that are for the first time coming out of the inner circle. These chants are transforming and being immense energy fields, the listener’s inner and outer realities become Source aligned. A 10 page booklet that provides insights to each track and the interesting wisdom of the mystical Siddhar yogis related to each mantra chanted. The invocation of 210 Siddhars, the Beings of Light is by Siddhar Rajaswamy carries with the invocation, the secretive location where each of these Masters meditated through their life. The details of the invocation is mentioned in the booklet. The continued inspired breath of Cave of the Siddhars: Invoke the Masters . After 5 years of intent to create waves of uplifting and upbeat music that embedded the innermost potency of joy with the Siddha mantra resonance, ARAKARA the Album was created. The meditative powers within the resonance as seeds of mighty consciousness, alongside the joys of the special musical composition is the dance of awakening. Arakara will make you dance in the sacred joys! CD Includes 15 page booklet with the Siddhar mantras, the deeper experiential wisdom within and the blessings of our ancient Siddhar lineage. Teachings of the Siddhar Sages- through the awakening grace of the Siddhar mantras pranayams (breathing techniques), visualization and awakening energies of the Siddhar Masters of South India. Nandhiji will take you through this inner journey of awakening. Attain the effortless state of enhanced meditation. Awaken your own inner Guru and obtain Self-Realization. Awaken Your Joys of Genius Through The Yogic Focused Mind. Transform limitations in all areas of your innate Divinely ordained potential. Invoke all higher consciousness Masters of the Siddha lineage to be your guides. Awaken and Experience your higher consciousness state of mind known as “Turiya”. Attain a daily practice that you do out of your desire for more joy, fulfillment, and inspiration from your own inner knowing.